Save yourself the excruciating pain and skip this piece of crap. We stopped here on our way home from Cedar Point so I could check this coaster and Blue Streak off of my list. The wicked rough transition between the helix and the bunnyhops slammed my head against the thin pad giving me a concussion that required a trip to the hospital for X-Rays as soon as I got home. I'm not sure whether this has happened to anyone else, or if I'm just unlucky, but I certainly won't be taking another ride. This is a standard toboggan, and unfortunately the standard toboggan is terrible. The lift was unique as always, but the cars were claustrophobic. I liked the tight helix down the tower, but the transition to the bunny hills gave a violent jolt and the final bunny hills were pretty rough. This was my first toboggan coaster. It was pretty bad. The ride looked to be in bad shape from the faded paint job and rampant spider webs. Then I actually rode it and it rode even worse. The ride around the tower is boring and slow, but you get a view of the lake, at least. The bunny hill after the descent is spine jarring. I agree with Larry on this one. An absolutely waste of coastering. 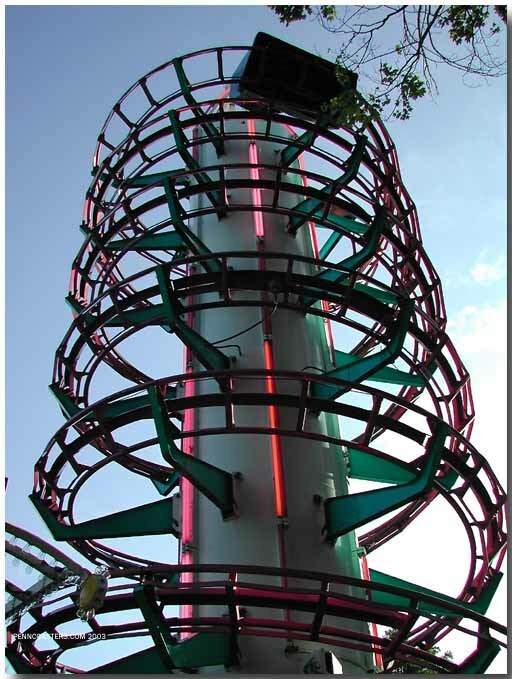 Amazing that people wont count powered coasters, but we should ride every clone of this thing to up our counts. You cant even enjoy the view of the lake due to the chicken wire in front of you. I will give CL credit for at least getting it running as there was a small but constant line throughout the night. Absolutely horrible, although this is my first toboggan ride it holds nostalgia for me. 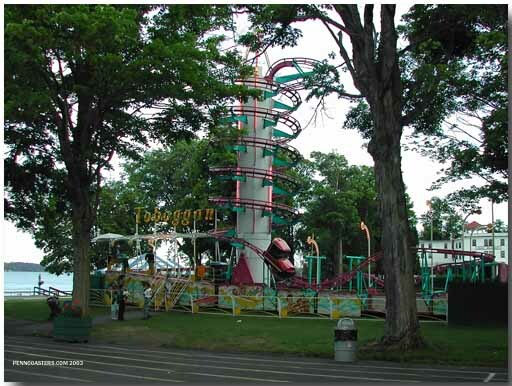 I remember seeing the Twin Toboggans on my childhood visits to HersheyPark, but was never able to ride. Mom was afraid of heights and dad was afraid of spinning. The cars are in bad shape. I get in and they close the cage and in front of me is a spider web on the cage. The top of the cage, which is lightly padded, rests on my head, and Im only 56". The car start going up the tube with the car perpendicular to the ground so Im on my back looking skyward. We the car gets to the top it makes a long, slow, uneventful, counter clock-wise turn around the tube 5 or 6 times. Then you approach a spine compressing bunny hop. Ouch! You pull into the station and run away as quick as possible cursing the ride. Sorry Toboggan, you dont even warrant any bouns points for nostalgia. The Toboggan is a steel sit down roller coaster. (Toboggan)It was built in 2002. It was built by Chance Company. It is 45' tall, It is 450' long. It is average speed, fun, rerideable, it has a large capacity, and a long duration.